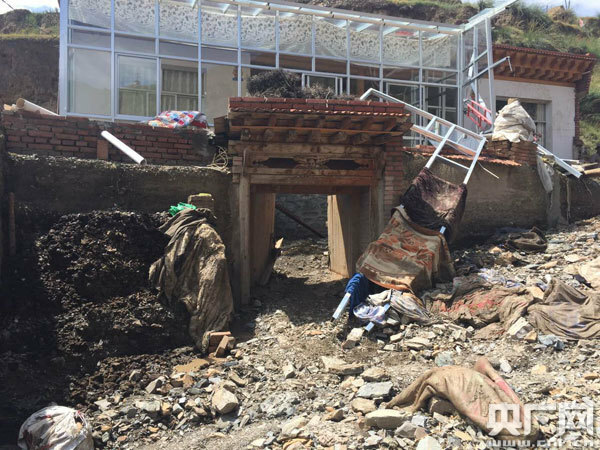 (TibetanReview.net, Aug30, 2016) – The Labrang Monastery in Xiahe (Tibetan: Sangchu) County of Gansu Province as well as surrounding and nearby areas were severely affected by a thunderstorm which hit the region on Aug 24 afternoon, reported China’s online Tibet news service eng.Tibet.cn Aug 27. It said about four hundred residences of monks were flooded while, in addition, 150 dorms had collapsed along with the courtyard wall. The report said the thunderstorm affected cities in both Xiahe and neighbouring Hezuo (Tsoe) County, besides other places. It said that in Xiahe, some 5,000 local residents were affected. More than 100 people were injured, although none was missing and there were no fatalities. A rockslide was reported to have occurred in the back side of the monastic studies institute, resulting in its large assembly plaza and parking lot being covered by 800 square metres of mud. The report said a portion of local residents had to be relocated. Water and electricity facilities as well as traffic installations were reported damaged. In neighbouring Hezuo County, a freeway road was reported to have collapsed on Aug 25 morning, necessitating a traffic diversion to a provincial highway.